The rise of social media has given birth to a powerful new form of marketing. With digital marketing now a viable way to create and convert leads while boosting your brand’s image, some of social media’s biggest names have gone the extra mile in offering unprecedented advertising opportunities. Facebook, in particular, has set up a powerful advertising system that gives businesses incredible flexibility in establishing a digital marketing campaign. With multiple targeted ad systems that can aid your business in a variety of ways, Facebook is one of the hottest social media websites for business advertising. If you’re looking to get started building your brand’s reputation through a solid digital marketing strategy, having an understanding of the different types of Facebook ads is a must. Don’t let this overwhelm you. We understand just how difficult it can be attempting to make sense of all the various information you’ll need to build an effective digital marketing strategy. That’s why we’ve put together a comprehensive guide to Facebook ads so that you don’t have to waste your time scouring the Internet in an attempt to put all the information together. Our guide includes everything you ever need to know about the different types of Facebook ads, the benefits of each one, and how you can start using them to boost your business’s bottom dollar. Photo ads make up the majority of Facebook ads and are a powerful way to incorporate links into your Facebook marketing strategy. If you’ve got an online website or shop, link clink ads need to be an important part of your digital marketing campaign. Link clink ads allow for you to promote your external website to a targeted number of individuals as defined by your advertising budget. Facebook makes it incredibly easy. Simply open your business’s Facebook page, and click on the “Promote” button. Once you’ve done this, you will be prompted by Facebook to select an ad category—the first of which being to promote your website. The first thing you’ll notice when you do this is that Facebook will autogenerate an ad based on your website’s URL and any recent posts that might be on there. Second, you’ll see that you have control over nearly every aspect of the ad: from the price to the duration to even the targeted audience. This powerful ad strategy gives you the option to promote your website to an audience you believe will be interested in your products or services, as well as to individuals you’re trying to win over. The number of individuals who will see the ad in their news feed depends on how much you’re willing to spend per day on your advertising budget, so keep this in mind as you plan for your ad. Finally, you may notice that Facebook offers a button option before you post your ad. Adding a button is a great way to put a call-to-action in your advertisement. If you’re linking back to your webstore, for instance, you may choose the “Show Now” button. Those who are looking to recruit more users to their websites, however, may decide that the “Sign Up” button is better. By adding a button to your link click ad, you can secure more leads. Carousel ads are another powerful form of Facebook advertising. Great for those looking to show off multiple products, Carousel ads allow for revolving carousel cards that can highlight several aspects of your business or products that you sell. 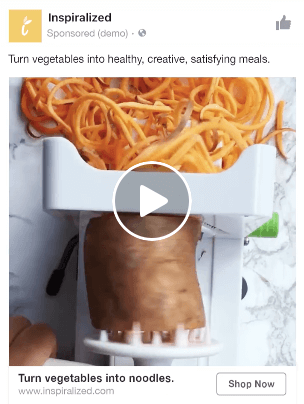 Additionally, like link click and all other ads on Facebook, carousel ads are easily customizable and able to be targeted to a specific demographic. Carousel ads are especially useful when showcasing a promotion on behalf of your business. Do you have a deal on a full-line of products? Make sure that your potential customers can see as much as possible by putting up to ten cards in your carousel. That’s right! With Facebook’s carousel ads, you get up to ten chances to advertise the products you want. Only 125 characters of text are allowed. 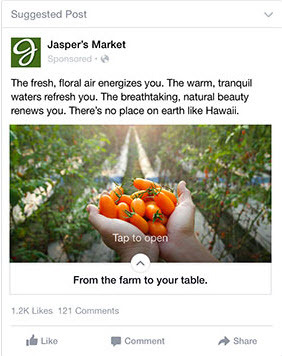 One of Facebook’s newest ad features, stories ads are also some of the hottest growing. Facebook backs up the utility of stories ads with some impressive statistics. They note that over 400M+ people use Instagram Stories every day, with over 300M using Facebook and Messenger Stories every day. They even predict that the number of stories being shared will surpass that of feed content sharing sometime this year—making stories a powerful marketing opportunity. Even better, according to Facebook, 58% of people who see stories ads are likely to visit the brand’s website, and a whopping 31% have actually gone to the brand’s store to check it out. What more could you ask for than that? If you haven’t started using Facebook stories ads, now’s your chance. Make sure to take advantage of this powerful opportunity to start growing your business’s reputation and converting more sales. With over 1.3 billion active users every month, Messenger is one of the most popular messaging platforms in the world—making it the perfect place to put your next ad. Facebook estimates that over 10 billion messages are sent over Messenger every MONTH, meaning that people are on it—a lot. Even some people who aren’t regularly active on Facebook. This means that if you place your ad on Messenger, you’ll be able to potentially reach an even bigger crowd and new people. The good news is that placing an ad on Messenger works much the same way it does on Facebook, making for an easy and streamlined experience. Messenger also includes powerful chat-to-Messenger options that allow customers to chat directly with your business-making it great for your retargeting campaign. That’s right—using Messenger to retarget your potential customers is a great way to start closing more sales. Use it to direct prospects back to your website or into a chat box so that they can talk directly with your business. Whatever you decide, this highly-targeted method of advertisement is sure to help your business. If you’re looking for an ad type targeted to making you sales, look no further. 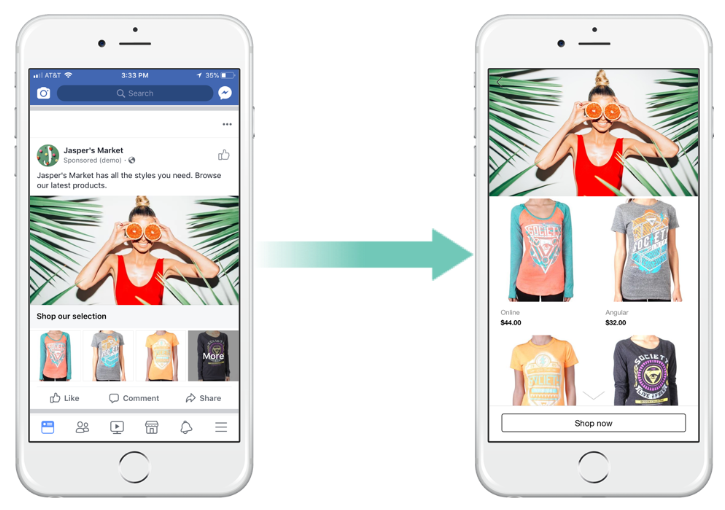 Collection ads offer a one-of-a-kind experience that allows customers to shop your products inside the ad without ever having to leave Facebook. Collection ads include a fast-loading interface with a central photo or video with a four-photo grid surrounding it. Instant LookBook—used to highlight your brand’s collections or story, among other things. This interactive ad experience is one of the best for boosting your investment returns. Playable ads are a specialized type of ad and are great for those looking to garner interest in a new game or app. Playable ads show a small preview of the game that is being promoted, giving users a taste in order to entice them to download it. If you’re considering getting a playable ad for your product, also note that users can actually play a attest bit of your game from inside the ad—helping you secure sales and downloads. If you’re looking to stay ahead of the curve, it’s time to start investing in video ads. Anywhere from minutes-long ads to short videos and GIFs, video advertising is the way of the future. In fact, Facebook notes that by 2021, 78% of mobile data will be in video format. That means it’s time for your business to join the movement. You don’t want to get left out of this growing consumer trend. Video ads can be incorporated into a variety of different advertisement types—from stories to carousels. Selecting the right type of video for your ad is important—and research shows that you don’t want to make it anything too long. By incorporating video advertising into your digital marketing strategy, you can attract more individuals to your business. Stay ahead of your competitors by making the switch to Facebook’s video advertising. Slideshow ads are great for those on a budget—or for those targeting people on a budget. These compact-sized ads use pictures to form a quick video that highlights your benefits to your potential customers. Because they’re not really full-scale videos, slideshow ads load much faster—making them great for consumers with a slower Internet connection (take this into consideration when choosing your target audience). These quick ads also save you money by giving you similar results as video ads without charging you similar prices. If you’re looking for a cheap, quick way to highlight the benefits of your product or service or need to reach those with slower Internet connections, consider making slideshow ads one of your top priorities. Boosted pages may not technically be considered “ads” in the truest sense of the word, but they are a powerful form of paid promotion. By boosting pages, you’re able to significantly increase the reach of specific posts on your page. If you post something to your business’s page, you can find the “boost post” option under the post you’re wishing to promote. The best part about boosting posts is that it’s relatively cheap—and you can see a targeted metric of just how many users can potentially see your post depending on the amount of funding you choose to use. Post boosts can be a powerful way to get specific content out to others, making it perfect for those times when you have a promotion or deal that you don’t want your customers to miss. Once a post is boosted, it will be sent out into the news feeds of individuals in the area you’ve chosen to target. These individuals will see the post in their newsfeed as they scroll through. The downside to page boosts—and what keeps them from being strictly qualified as ads by some—is the fact that they work on a post-by-post basis and aren’t really great for selling a product directly. They can, however, boost your business’s reputation and top-of-mind awareness, so keep them in mind as you work to increase your company’s digital presence. Facebook’s digital ad options are the perfect addition to every digital marketing strategy. With several different ad options available, Facebook proves one of the most powerful platforms from which you can launch your digital campaign to boost your business’s image and profits. By understanding these different advertising types, you can help put your business on the map and increase its reputation. With several low-cost and effective solutions, Facebook’s digital ads prove some of the best in the industry. Don’t get bogged down trying to take in complicated Facebook ad information. Check out our guide above instead to find out which type of ad is best for you so that you can get started building your digital strategy today!